When Netanyahu told him to follow red lines painted on the tarmac, Obama joked about Netanyahu's tendency to paint such lines for him. In an off-the-cuff response, Obama joked about Netanyahu's tendency to paint red lines – a reference to his famous U.N. speech about the Iranian bomb – and Netanyahu also answered jokingly that the red lines on the tarmac were in fact part of an Israeli plot that was meticulously planned in advance. Reporters noted that when Obama took off his jacket to walk down the tarmac in his shirtsleeves, Netanyahu quickly took of his jacket as well. Obama traded some banter with the new Treasury Minister, Yair Lapid, and needled him about having left a much better job as television anchorman for the challenge of being in charge of the economy. Judging by body language and small talk, then, Obama appears to be relatively in charge and confident. 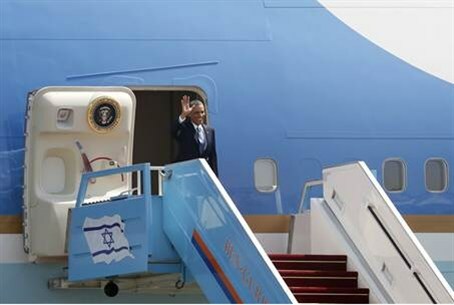 Why he chose to make the trip to Israel is not completely clear to most analysts. The two appeared relatively relaxed when Netanyahu greeted Obama on the tarmac after he stepped off of Air Force One earlier Wednesday. When Obama was unsure of where to walk, Netanyahu told him to follow the red lines that were painted on the tarmac. Obama joked about Netanyahu's tendency to paint red lines – a reference to his famous U.N. speech about the Iranian bomb – and Netanyahu also answered jokingly that the red lines on the tarmac were in fact part of an Israeli plot that was meticulously planned in advance.